Chinese President Xi Jinping sent a congratulatory letter to a Chinese Academy of Sciences (CAS) research team comprising scientists, young students and support staff that went on the second expedition to the Qinghai-Tibet Plateau. Xi Jinping urged them to focus on problems related to the capacity of resources and the environment, disaster risk as well as green development on the plateau. He described the Qinghai-Tibet Plateau as an important ecological safety barrier and strategic resource reserve base while observing that the expedition will promote the plateau's sustainable development and the world's ecological environmental protection. Vice Premier Liu Yandong read the letter at the ceremony held in Lhasa. The expeditions are to analyse the impact of environmental change on social development and provide suggestions for building a national park in the area. China's first comprehensive scientific expedition travelled to the plateau in the 1970s. China's Tibet Airlines started its first direct service on the Chengdu-Kathmandu-Chengdu sector on August 8, 2017. The Lhasa-based Tibet airlines has a 49 percent stake in Himalaya Airlines, a Nepal-based international airline company. According to Himalaya Airlines, the Tibet Airlines will operate the Airbus 319 on the route and fly four flights a week. The Civil Aviation Authority of Nepal granted permission to Tibet Airlines to fly on the route last month. Tibet Airlines is the fifth Chinese airline to operate in Nepal after Air China, China Southern, China Eastern and Sichuan Airlines. Chinese tourist arrivals in Nepal jumped 55.26 percent to 104,005 in 2016. The Tibet Autonomous Region (TAR) People's Government convened a meeting in Lhasa on August 12, 2017, when TAR Vice Chairman Dorjee attended and delivered a speech. The Vice Chairman of the district PPCC, Chairman of the District Federation of Industry and Commerce and the President of the Chamber of Commerce attended. The meeting asserted that Tibet is an important national and ecological security barrier, strategic resource reserve, world tourism destination and an important channel for South Asia. Dorjee said that, at present, Tibet is in the best development period in its history. He announced that the TAR People's Government would give preferences to those starting new business ventures with good investment prospects, space for development and expansion of their enterprises in mainland China. The Conference concluded by urging entrepreneurs with knowledge of science and technology to lead industrial development of Tibet so as to encourage other aspiring entrepreneurs. The Vice Chairman of TAR People's Government, Jiang Jie, presided over a teleconference in Lhasa on August 19, 2017, to promote and review the judicial system in TAR. The meeting emphasized the importance of comprehensively embracing and implementing General Secretary Xi Jinping's ‘important' speeches. It also discussed and assessed the extant judicial system. TAR Political and Legal Committee Secretary He Wenhao was invited as the guest speaker. Jiang Jie, Vice Chairman of the TAR People's Government convened a special meeting to discuss the construction of the Tibetan Youth Palace Project, an initiative of the Guangdong Province ‘Aid Tibet' batch. Jiang Jie pointed out that the Tibetan Youth Palace is one of the key projects of the TAR Party Committee to which all leaders in the region attach great importance. The Project, according to Jiang Jia, will carry out off- campus activities that would instill patriotism and national unity in the youth. He directed the concerned departments for its speedy construction and operation, emphasizing at the same time the need for scientific planning and fine engineering. The Tibet Poverty Alleviation Office has claimed that approx. 150,000 rural residents in TAR were lifted out of poverty last year. Lu Huadong, Deputy Director of the Tibet Poverty Alleviation Office, said “The autonomous region has invested 4 billion yuan (around US$ 600 million) to promote industries with local features in poor areas, and relocated 77,000 poor people last year." He added that statistics showed that Tibet had around 590,000 rural poor by the end of 2015. It plans to help at least 130,000 rural people cast off poverty and relocate 163,000 residents in 2017. Lu Huadong said, "This year is a key period for Tibet's war against poverty. We will continue mapping out policies and plans in accordance with varying situations and causes of poverty and increasing funds" adding that 43 million people in rural areas were living in poverty at the end of 2016 in China and that the goal is to help all of them out of poverty by 2020. Lhasa Municipality Party Secretary, Qi Zhala (Tib: Choedak/Chedak) presided over the Executive meeting of the TAR People's Government on August 18, 2017. The meeting's key objectives included discussing the report on environmental protection in Tibet and the appointment of members of the Autonomous Region's central environmental protection inspection team. The meeting stressed the importance of ‘absolute loyalty to the party central committee with ‘Comrade Xi Jinping at the core'. Leading cadres at all levels in the region were asked to pay attention to ecological and environmental protection. The meeting directed that environmental issues assigned to the central environmental inspector must be carried on and implemented on time and that any problems related to environment should be solved in a very limited time. The Lhasa Municipal PPCC and Deputy Party Secretary, Vice Chairman, Party Secretary and other authorities led an in-depth research team to Xietongmen city, Dingri, and Gyirong County. City PPCC Chairman Pengpu led the research team to report on the work of the PPCC and township (neighborhood offices) and the PPCC Liaison Office. Gao Zhen pointed out that the establishment of Shigatse City and the township (street) offices by the PPCC Liaison Office was to implement the policy requirements of the central and autonomous regional party committee. It was also to promote the PPCC's grassroots work for socialist democratic development. He mentioned that the most important requirement is that they should study the spirit of the important speeches given by Xi Jinping, especially on the new idea of governing the country and understanding the history of different ethnic peoples and religions. He said the PPCC's daily work includes introduction of reforms and stabilizing society and that its most important role is to inspect and supervise implementation of the major policies introduced by the Party and government. The fourth meeting of the First People's Congress of Shigatse City selected Kunsang and Sonam Gyalpo as its representatives. The Twentieth Meeting of the Standing Committee of the First People's Congress of Shigatse Prefecture agreed with the report of the Qualification Review Committee and confirmed Kunsang and Sonam Gyalpo as representatives and asked them to continue in their posts. The meeting also removed five delegates. The five leaders are: Lhakpa Phuntsok (Kyirong County delegate, Tsering Yangzom (delegate of Dingchen County), Zhou Guiqing (delegate of Renbu County), Zhang Yang (delegate of Gyangze County), and Tashi (delegate of Dingchen County). In accordance with Article 49 of the Law of the People's Congress of the People's Republic of China, the five delegates were dismissed. The representative of the First People's Congress of Shigatse, Zhou Yi (Zhongpa county delegate) had to resign from his post due to health reasons. There are now 261 representatives in the First People's Congress of Shigatse city. O n August 23, the TAR Party Committee and Vice Chairman of the Tibet Branch of the Buddhist Association, President of the Tibetan Buddhist Institute Zhukang Thubten Khedup and the Shigatse Temple propaganda team went to Tashilhunpo Monastery to carry out the teaching of “four stress and four love” in the religious areas. They also wanted to propagate the importance of ‘patriotic love'. United Front Work Minister of Shigatse Municipal Committee, Pasang presided over the activities of the Municipal People's Political Consultative Conference and Vice Chairman Gyaltsen Nyendak attended the event. The activities stressed that monks, cadres and workers should further strengthen "four consciousness" to the core of the Party. They emphasised the importance of developing a sense of politics and sense of honor in any kind of educational programme carried on by the party. Monks were told to be more development oriented in religious culture and follow the laws proposed by the Party. The Tibet Development Foundation and Beijing Tongren Ophthalmology Zhang House Public Foundation's "Shigatse Community Tour" donation ceremony was held at Tashilhunpo Monastery. The Vice President of the Chinese Buddhist Association and Chairman of the Tibet Development Foundation and the Chinese appointed Panchen Lama, Gyalten Norbu, attended the ceremony. Kelsang Tsering, Party Secretary of the Tibet Autonomous Region Ethnic and Religious Affairs Committee, praised the "Shigatse Public Welfare Committee" by saying that it is the Beijing-based Tongren Zhang Xiaolou Eye Foundation, which first came to Tibet for carrying out charitable activities. It established a free eye clinic for the masses and also donated sunglasses and eye lamps to the masses. The Beijing colleagues of the Zhang Xiaolou Eye Foundation carried out surgeries on 32 patients. Kelsang Tsering expressed the wish that the Beijing Tongxiong Zhangxiao Lou Eye Foundation carries out more public welfare activities to provide more opportunities for Tibetan medical institutions to learn. The Standing Committee of the 10th Tibet Region People's Congress held its 118th Directorial meeting on August 18, 2017. Lobsang Gyaltsen, Deputy Secretary of the District Party Committee, and Chairman of TAR People's Congress presided. The meeting discussed the report on the assessment of local legislative power in Lhokha (Ch: Shannan) and fully affirmed the work of Lhokha City to exercise local legislative power and mandated active implementation of the work of the assessment team. It also approved further strengthening the Lhokha Municipal People's Congress Standing Committee's local legislative powers. The meeting listened to the public security organs on the standardization and assessment of law enforcement reports and discussed the procedures for the law enforcement system. Lobsang Gyaltsen asked officials of the TAR People's Congress to seriously study and follow General Secretary Xi Jinping's important speeches, adding it is important for all leading cadres at the ministerial level to implement Xi Jinping's thought and speech in practice. TAR People's Congress Standing Committee Deputy Director Thinley, Secretary-General Liu Guangxu and others like Tenzin Lhagyal, Shinza, Tenzin Choedrak, Woesel, Li Wenhan, Zhang Xiaohua, Ji Guogang attended the meeting. The 7-day Danglung border commodity fair started in Nanggarze County on August 13, in Lhoka. More than 1000 commercial entities from Lhasa, Shigatse, Lhoka, Ngari administrative districts took part in the fair. The Deputy Secretary and Governor of Nanggarze County, Luo Wenjin, inaugurated the fair. The fair aims to enrich cultural and tourism resources and increase the incomes of the native Nanggarze county people. The Fair includes native products, and exhibits of national handicrafts and cultural heritage. The Lhasa - Nyingchi Tibet MainlingTunnel project at an elevation of over 5018 meters above sea level and cutting across the Mila Mountain is reported to be 70% complete. Once completed it will shorten the distance between Lhasa and Nyingchi by half. T he tunnel will be the world's highest highway tunnel and one of the highest highways in Tibet. Local authorities confirmed that construction of the main road surface has been completed and work on green, mechanical and electrical construction remains. It is expected to open by the end of August. The main project of the 40.4 kilometre Shigatse Airport Expressway has been completed and handed over for inspection. Project construction was started in April 2016, to improve Shigatse city's traffic and improve the region's high grade highways. Total investment in the project is of Yuan 2.324 billion and it took 15 months to complete. The Expressway connects Shigatse Airport to Raocheng. Deputy Secretary of the Municipal Party Committee, Mayor Wangdu thoroughly checked the train station in connection with plans to build a new integrated passenger station on August 12, 2017. Vice Mayor Xu Longhai, accompanied by a research team also went there for inspection. Wangdu and his entourage went to the site of the proposed railway station and integrated passenger station and viewed the total floor plan, did a field observation of the land and asked in detail about the progress of land, construction, approval, etc. The Mayor listened carefully to the report on the progress of the work. After the inspection, Wangdui spoke about the importance of constructing the train station and asked officials to closely follow the guidelines on planning and construction with characteristics required for Nyingchi. The Tibetan Public Security Fire Brigade held a fire fighting and emergency rescue practical exercise in a high-rise building in Dulong Deqing District in Lhasa on August 18, 2017. Dulong Deqing District fire officers, soldiers and Dulong Deqing District Public Security Bureau police as well as three special squadrons of the Lhasa City Public Security Fire Brigade participated in the drill. A total of 19 various vehicles, 110 officers, men and forces were involved. The drill was to prepare a good fire safety environment for the Shoton Festival. The Lhasa Shoton Festival Investment Project Promotion hosted by the Lhasa Municipal People's Government and City Bureau of Commerce opened in City Hall of Heaven Inter-Continental Hotel on August 21, 2017. Investments worth 31.985 billion yuan in 75 projects are proposed to be signed. Lhasa City Vice Mayor Fang Guilin, at a meeting on the occasion, stressed the need for investment in the environment sector and industry in particular. Deputy General Manager Zhang Yingnan of Lhasa City Pure Land Industrial Investment and Development Co., Ltd. introduced various health products. The meeting also broadcast videos of the Pure Land Health Industrial Investment and Development Co., Ltd and issued more than 3500 copies of promotional material. The China Electronics Technology Group Corporation and other well-known enterprise groups from Beijing, Jiangsu, Anhui and other provinces and cities participated including representatives of the Tibet Chamber of Commerce and Tibet Shizu Shengquan Industrial Co., Ltd..
A Research Group from TAR, led by TAR Vice Chairman Dorjee Tsedup, travelled in Ngari (Ch:Ali) from August 4 to 8, to study the progress of the tourism industry. Dorjee stressed that Ngari must focus on building a world-class tourist destination. The Research Group went to Pulan, Zanda, Gar and other counties and investigated development of the local tourism industry and listened to the work reports of the Ngari Prefectural Party Committee and Administrative offices. The Research Group stressed that the tourist industry has the best potential to develop in Tibet. Dorjee reiterated that the Ngari Prefectural Party Committee, administrative office and all levels of party committees, governments and relevant departments must pay extra attention to the world's major tourist destinations, global tourism and tourism management mechanisms. Development of the tourism industry was identified as the top priority in the TAR Tourism Development Plan. Huang Xuqing, Executive Director of the Intermediate People 's Court of Hubei Province and his entourage visited Phungyal County, Lhoka (Ch:Shanan) People' s Court to study and ‘guide' work on August 27, 2017. The investigation team inspected, accessed information, and listened to the local court to build a comprehensive understanding of the work of the Chusum County People's Court and its difficulties and problems. The team donated 300,000 yuan to promote construction of the Chusum County People's Court. Huang Xuqing said that to catch up with the standard of national courts, he would continue to increase efforts to support the People's Court of Chusum County, Lhoka (Ch:Shannan) and provide possible assistance to strengthen and promote exchanges between the courts. Following Huang Xuqing's visit, infrastructure development work of the Chusum County People's Court is planned to start very soon. On August 10, Wan Hongliang, a Chinese legal aid volunteer lawyer from Jiangsu Province visited Gongga County of Lhoka's Judicial Bureau. Wan Hongliang has visited 8 townships of Gongga County and was appointed as a one-year legal adviser to the county's 8 townships. The legal adviser provides free services for the township and provides legal counselling services. Gongga County's Bureau of Justice has appreciated the initiative and stressed learning the legal process. Chinese delegation introduces Tibet's development in three countries. A Chinese Tibetan cultural exchange delegation visited Mongolia, Russia and Japan recently to brief them on the latest development al works in the Tibet Autonomous Region (TAR). China's State Council Information Office sent the delegations. The delegation consists mainly of Tibetologists , traditional Tibetan medicine specialists and Tibetan officials. The delegation commenced its journey from Mongolia on August 14 -15. It next went to Russia from August 16 to 19 and concluded its trip with a visit to Japan on August 23. The delegation answered questions concerning various aspects of Tibet, including economic and social development, improvement of people's livelihood, and Tibet's role in the framework of the Belt and Road Initiative . They spoke on topics like protection of traditional Tibetan culture, the reincarnation system of Tibetan Buddhism, a nd environmental protection and tourism in Tibet. Many scholars and politicians of the countries visited expressed a wish to visit China for exchanges on Tibetology and Tibetan medicine and to visit Tibet for learning Tibetan Buddhism and going on a pilgrimage or travelling. The agreement focuses on boosting connectivity in areas such as transit, roads, railways, trade, aviation and power. Nepal has also been in talks with China to build a cross-border rail link that may cost up to US$ 8 billion. In an interview with Reuters in May (2017), Yug Raj Pandey, an undersecretary at Nepal's Ministry of Finance, said the two countries had been in discussions for the past five months about the project, which could cost US$ 7-8 billion and take up to eight years to complete. Negotiations are still continuing. Supporters of Tibet's independence as well as of Eastern Turkestan (Chinese: Xinjiang), Southern Mongolia and Taiwan, besides Chinese Democracy activists, resolved to work together to further their cause at the end of the Fourth International Rangzen Conference which was held in Paris from August 21-23. The conference, organized by private individuals as on previous occasions, brought together more than 100 participants from India, the United States, and Europe. The participants – who were mainly Tibetans but also included Uyghurs, Mongols, and Taiwanese -- rejected Chinese authority in a declaration adopted at the end of the conference. 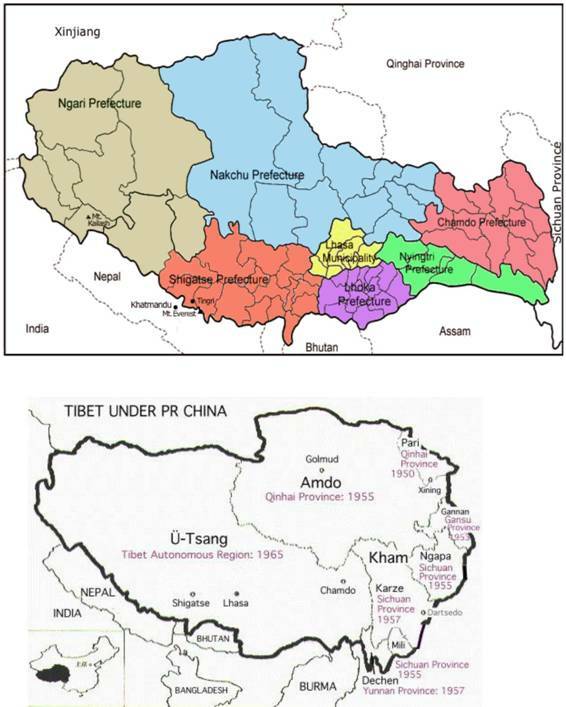 Referring to the current ongoing border standoff between India and China at Doklam, the conference declared that the conflict resulted from China's colonization of Tibet; that China had no legitimacy in the conflict, which, however, will not be resolved without the restoration of Tibet's independence. Participants in the conference included five members of the Tibetan parliament in Exile who spoke on different topics. One of the major participants in the three-day Ubuntu/Botho peace conference, which opened on August 17, 2017 in Botswana's capital Gaborone, has pulled out, citing the Dalai Lama's absence. Botswana's former Vice President Ponatshego Kedikilwe said he was opting out because the discussion was to be with the Dalai Lama and it could no longer be held. Chinese authorities have announced the appointment of Chinese Communist Party members to key positions at Larung Gar Tibetan Buddhist Institute to exercise direct control over the management and day to day operations of the world's largest Tibetan Buddhist institute in Larung valley in Tibet's Serthar (Ch: Seda) County in Kardze (Ch: Ganzi) Tibetan Autonomous Prefecture, Sichuan Province. The appointment of Party members is a part of the overall measures announced in the eight-point document issued last year. Citing the decisions taken at the Sixth Tibet Work Forum Conference and the Second National Work Conference on Religion , the document had announced that a Monastery Management Committee consisting of party and government officials would be established to run the institute. It had also called for the implementation of “social management” and provision of social services within the Larung Gar community. On August 20, the Kardze Prefectural authorities announced the appointment of six Party members, five male and one female, who are all Tibetan. Three of the appointees have been given the charge to manage Larung Gar Five Sciences Buddhist Academy (Tib: Ngarig Nangten Lobling). The other three will head the Larung Gar Monastery Management Committee. Dakpa, currently the Deputy Director of Kardze Prefecture Public Security Bureau, has been appointed the Party Secretary of the academy as well as President of the Academy. Dhondup Tashi, the incumbent Deputy Secretary of the Gyesur (Ch: Jiulong) County United Front Work Department and Chairman of the County Bureau of Ethnic and Religious Affairs, is appointed Deputy Party Secretary of the Academy and Vice President of the Academy. Lokhang Pun, a prefecture government researcher in Tibetan studies and section officer for the Prefecture government's library and translation department has been named the Deputy Party Secretary of the academy and Vice President of the academy. Dargye Tashi Tsering, Sonam Choephel and Sonam Yangzom will take charge of the Larung Gar Monastery Management Committee (MMC). Sonam Choephel, who has held the post of Deputy Party Secretary of Serthar County since September 2016 has been named Party Secretary of the MMC and Director of the Monastery. Dargye Tashi Tsering, the incumbent Deputy Party Secretary of Politics and Law Committee of Dabpa (Ch: Daocheng) County has been appointed Deputy Party Secretary and Deputy Director of the Monastery. Sonam Yangzom, the only female appointee, who is also the incumbent Party Secretary of Tsosum (Ch: Liantang) Township in Lithang County, has been appointed the MMC's Deputy Party Secretary and Deputy Director of the monastery. On August 13, 2017, the TAR Civil Committee , led by the Autonomous Region Civil Office, organized the TAR "Era Model" leadership selection activities. After strict examination the selection of 25 individual candidates and 15 collective candidate units were revealed to the public by Tibet Daily on August 13. 2. Shijiazai Tabu - Captain of the border police station security guard of Changuo Township, Saga County. 3. Wei Fa Ming - General Manager of Tibet Western Development Building Co., Ltd.
7. La Zhongqaing - the Village Committee Director of Chapan Town, Linzhi City, Chayu County. 9. Domey Wangdue - Deputy Director of Public Security Bureau of Changdu City. 10. Yangdu - Party Secretary of Xiangqu Townshi of Biru county, Nagqu prefecture. 16. Pasang Dolma - District Commissioner for Discipline Inspection Standing Committee, Deputy Director of the Office of Supervision, Ombudsman of Department of the Discipline Inspection . 20. Wang Nan - Armed Police Tibet Corps First Detachment, Squadron Leader of the Fire Brigade Defensive Squadron. 23. Sonam Dolkar - Staff Manager of Sanitation Cleaning Co.,Ltd of Chengguan District in Lhasa City. 25. Jampa Yangtso -, Professor of Tibet Institute of Animal Science and Dean of Animal Science.